The proposed book starts with a Legal Disclaimer, which identifies projects presented in this book as engineering examples for educational purposes only, not to be used as replacement of or in conjunction with professional medical treatment. Chapter I presents the development of amplifiers designed specifically for the detection of biopotential signals. This chapter has a refresher on op-amp-based amplifiers discussed in the context of the amplification of biopotentials. 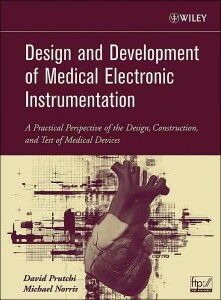 Projects for this chapter include: chloriding silver electrodes, a high-impedance electrode buffer array, a pasteless bioelectrode, a single-ended ECG amplifier array, a body potential driver, a differential biopotential amplifier, an instrumentation-amplifier biopotential amplifier, and a switched-capacitor surface array EMG amplifier. Chapter II looks at the frequency content of various biopotential signals, and discusses the need for filtering and the basics of selecting and designing RC filters, active filters, notch filters and specialized filters for biopotential signals. Projects for this chapter include: a DC-coupled biopotential amplifier with automatic offset cancellation, biopotential amplifier with DC rejection, AC-coupled biopotential amplifier front-end, bootstrapped AC-coupled biopotential amplifier, biopotential amplifier with selectable RC bandpass filters, state-variable filter with tunable cutoff frequency, twin-T notch filter, gyrator notch filter, universal harmonic eliminator notch comb filter, basic switched-capacitor filters, slew-rate limiter, ECG amplifier with pacemaker spike detection, “scratch and rumble” filter for ECG and an intracardiac electrogram evoked-potential amplifier. Chapter III introduces the safety considerations that must be made in the design of medical device prototypes. It includes a survey of applicable standards, and a discussion on mitigating the dangers of electrical shock. This chapter also looks at the way in which equipment should be tested for compliance with the safety standards. Projects for this chapter include: the design of an isolated biopotential amplifier, a transformer-coupled analog isolator module, a carrier-based optically-coupled analog isolator, a linear optically-coupled analog isolator with compensation, an isolated 8-channel 12-bit A/D converter, an isolated analog-signal multiplexer, a ground bond integrity tester, a microammeter for safety testing, and a basic HiPot tester. Chapter IV discusses the international regulations regarding electromagnetic compatibility and medical devices. This includes the mechanisms of emission of and immunity against radiated and conducted electromagnetic disturbances, as well as design practices for electromagnetic compatibility. Projects for this section include: a RF spectrum analyzer, near-field H-Field and E-Field probes, a comb generator, a conducted-emissions probe, a line impedance stabilization network, ESD simulators, a conducted disturbance generator, a magnetic field generator, and a wideband transmitter for susceptibility testing. Chapter V presents the new breed of “smart” sensors that can be used to detect physiological signals with minimal design effort. The chapter discusses analog-to-digital conversion of physiological signals, as well as methods for high-resolution spectral analysis. Projects for this chapter include: a Universal Sensor Interface, sensor signal conditioners, using the PC sound card as a data acquisition card, a VCO for DC-correct signal acquisition through sound card, as well as FFT and high-resolution spectral estimation software. Chapter VI discusses the need for artificial signal sources in medical equipment design and testing. This chapter reviews the basics of digital signal synthesis, arbitrary signal generation and volume conductor experiments. Projects for this chapter include: a general-purpose signal generator, a direct-digital-synthesis sine generator, a 2-channel digital arbitrary waveform generator, a multi-channel analog arbitrary signal source, converting the PC sound card into a DC-correct arbitrary signal generator, a cardiac simulator for pacemaker testing, and how to perform volume-conductor experiments with a voltage-to-current converter and physical models of the body. Chapter VII looks at the principles and clinical applications of electrical stimulation of excitable tissues. Projects for this chapter include: the design of stimulation circuits for implantable pulse generators, the fabrication of implantable stimulation electrodes, an external neuromuscular stimulator, a TENS device for pain relief, and a transcutaneous/transcranial pulsed-magnetic neural stimulator. Chapter VIII discusses the principles of cardiac pacing and defibrillation. The chapter provides a basic review of the electrophysiology of the heart, its conduction deficiencies and arrhythmias. Projects for this chapter include: a demonstration implantable pacemaker, an external cardiac pacemaker, an impedance plethysmograph, an intracardiac impedance sensor, an external defibrillator, an intracardiac defibrillation shock box and a cardiac fibrillator. The Epilogue is an entrepreneurial engineer’s perspective on bringing a medical device to market. It discusses the regulatory path, FDA classification of medical devices and submitting applications to the FDA. It also looks at the value of patents and how to recruit venture capital. An Appendix provides the addresses, web sites, telephone numbers and FAX numbers for suppliers of components used in the various projects described in the book. Click here for book’s index. Click here for book errata.